As I made my way through airport security in Boston, a few things hit me. First, it dawned on me that I’ve barely recovered from the lengthy travel during the recent #exosuitproject at #Antikythera in Greece. Second was that for some reason, the travel process was smoother than ever – perhaps a function of both routine and repetitive recent experience, but also that the entire airport experience did seem to smooth itself out. Security was almost too efficient, leaving me shoeless, beltless, and somewhat a disheveled mess as I was shuffled through in what seemed to be hyperspeed. Nevertheless, the connection through JFK was equally smooth, and so I was on my way to Hong Kong via a 16 hour non-stop journey. I ate well, slept well, was relatively well entertained with a few movies, did more catch-up office work than I had in weeks, and so there I was – the international business traveler. I guess this is how they all do it, and how I now have to do it while riding in the wake of kids, a house, a fulltime job, and still trying to live the dream one day at a time. I was invited to Hong Kong by Dr. Leo Chan of the State Key Laboratory for Marine Pollution at the City University of Hong Kong. His students greeted me at the airport, and helped me get settled in for the night at the University. While jet lagged, the hospitality was warmly welcomed, and that persisted throughout my short visit…I am looking forward to developing future collaborations here in Hong Kong. 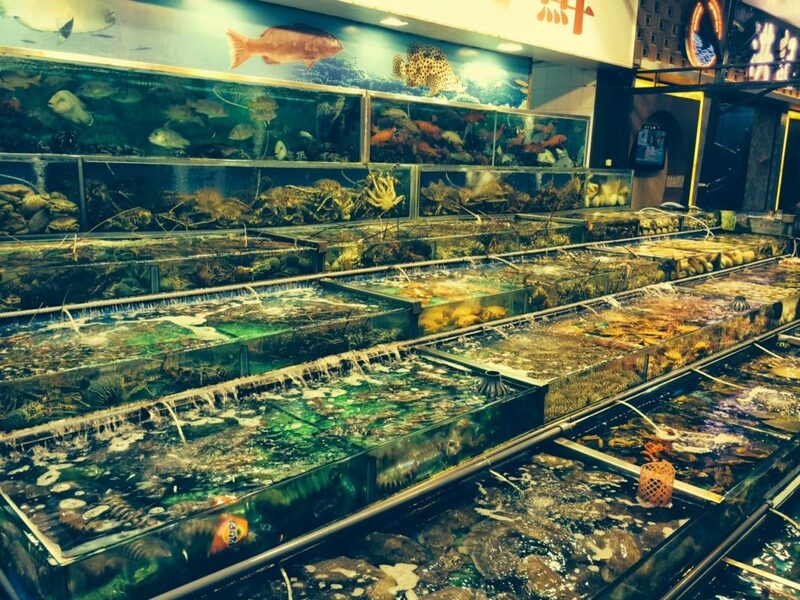 Seafood – this is what it’s all about in Hong Kong. Photo by M. Lombardi 2014. The visit was a bit of a brief information exchange, where I presented a lecture about advanced and deep scientific diving, focusing on our recent work with the Exosuit, and Dr. Chan shared his work in marine pollution, particularly as it applies to human health and sustainable seafood. I’ve always been particularly attracted to science and scientists that can well communicate how their work comes full circle to ultimately improve our quality of life. The work here at CityU does all of that, and is on the verge of a taking a new bold step in a leadership role in scientific diving, and at a national scale. The critical importance of placing the human within the environment to interpret that space and formulate new scientific inquiry is well appreciated in Hong Kong, and is emerging in China, and a direction that I’m eager to support however possible. While a whirlwind visit, I was able to take a brief stroll through downtown Hong Kong. It’s a busy place, and struck me as analogous to New York City. Lots of people, lots of lights, and lots of action. We walked through ‘occupy Hong Kong’, the local movement that the US nightly news has portrayed as a hot zone for violence in recent months. In my opinion, while yes, the people participating in the movement have taken a strong stand, it is not unlike protests back in the US and elsewhere – the violence is certainly not sought after. Things can and have escalated, but again, not unlike similar demonstrations back at home. Hong Kong also struck me as a very ‘vertical’ city. They build up, and in a big way. Interestingly, the population center of Honk Kong only accounts for 30% of the city’s land area. The balance 70% is protected habitat. That is truly amazing, and speaks to the commitment to the environment and appreciation for the value of its natural resources. Also somewhat striking is the apparent ambition of the people at the University. Those few I interacted with are hungry to succeed, and it seems to me that the government puts resources in place to foster that success. That is a very encouraging model to see, and stark contract to other places I’ve visited. The author would like to acknowledge the City University of Hong Kong and the J.F. White Contracting Company for making this visit possible; and the generosity of Dr. Leo Chan throughout the visit.